Canada is confident assurances from India will be enough to prevent the accused in a so-called honour killing of being mistreated if extradited, a lawyer has told the Supreme Court. 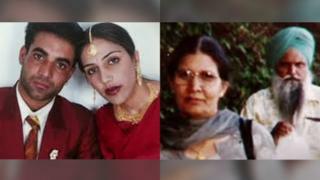 Malkit Kaur Sidhu and Subjit Singh Badesha are accused of orchestrating the murder in 2000 of Jaswinder “Jassi” Sidhu in Punjab. Their lawyers argue they could face abuse in the Indian prison system. Canada’s highest court is hearing the case after years of appeals. Mrs Sidhu, Jassi’s mother, and Mr Badesha, her uncle, deny any involvement in her death. The apparent “honour killing” of Jassi, a young Indian-Canadian woman, over a clandestine marriage to a man her family considered unsuitable, and the efforts to bring those behind it to justice have been followed closely in North America and India for years. The accused were arrested in Canada in 2012 under the Extradition Act following an international investigation by the Royal Canadian Mounted Police (RCMP) and Indian authorities. India wants them to stand trial on charges of murder and conspiracy to commit murder. Government lawyers appealed to Canada’s highest court after a surrender order was struck down by a British Columbia appellate court in 2016. Mrs Sidhu and Mr Badesha argue that they could face torture and abuse in the Indian prison system and might not get a fair trial. Both are elderly and suffer from age-related chronic ailments. Mrs Sidhu’s lawyers also made reference to reports of the gender-based violence in India jails in arguments against extradition. The Supreme Court’s eventual ruling could have implications beyond this particular case, a point underscored on Monday by Department of Justice lawyer Janet Henchey. “It undermines the entire concept of extradition and sending people to the country where they have allegedly committed a crime if we refuse to surrender based on imperfections in our treaty partner, even sometimes large imperfections,” she told the court. Ms Henchey also said the reputation of countries that have extradition treaties with Canada would “be on the line” if they failed to live up to diplomatic assurances that people would not be mistreated while in custody. On 8 June 2000, Jassi, 24, and her husband Sukhwinder “Mithu” Singh were ambushed by a group of attackers in Punjab, India. Mithu was badly beaten while the body of Jassi, with her throat cut, was found in a ditch the next day. The young woman had fled her Canadian home to India after months of alleged abuse and harassment at the hands of her family, since they discovered her 1999 marriage to Mithu, a rickshaw driver. Three men in India were eventually given life sentences for the attack. The RCMP worked with Indian authorities to investigate the case. The Canadian Lawyers for International Human Rights, the Canadian Centre for the Victims of Torture and the Canadian Council for Refugee are fighting extradition. Their lawyer warned the judges on Monday that diplomatic assurances, like those received from India in this case, were “inherently unreliable” and relying on them was an “abdication” of Canada’s responsibility to fight human rights abuses. The court said it would reserve its decision to a later date. Fabian Dawson, a journalist and author who has been reporting on the case for years, said he is “not surprised but still flabbergasted” at how long extradition cases can take in Canada. “It is my belief, after covering this case for almost two decades, that Jassi will not get any justice from the people who orchestrated this crime,” he said.